Over the years the LS1 canard spars have been getting harder to find. A friend "down under" has created an alternative product. Peter Harris of Australia submits the story below. It has been 3 years since my engine failed about a mile from the airfield. I did not quite make it over the fence on final. On that fateful descent I turned final at 1200ft with plenty of height and 90mph expecting to side slip for a safe landing but the mid morning sea wind had arrived and was gusting 5 to 25mph. When I saw the fence, I dropped the nose to pick up speed and pulled back. I thought I had cleared the fence, but the right hand wheel pant clipped the top of a post and ripped off. At the same time a steel star picket clipped the firewall, and then slashed through the belly spilling all the fuel in the grass. It left a strip of Velcro untouched under my right buttock. As I impacted with the fence post, the Q turned flat through 180 degrees in about 50ft. Then the tail speared into the grass and broke the tail spring. At the same time, the left canard speared into the grass and shattered about mid span . The left main wing just kissed the grass without damage. As I got out unhurt, I blessed the cockpit for its unbreakable strength. A few locals ran up and helped me load my Q onto a couple of hay bales on a trailer and we towed it to the hangar. Intent on making the necessary repairs, I spent the next three months fishing the Q-List for spars. Almost had someone convinced to sell me their spars from their kit, and make Waddelow wings for their Tri-Q. When that deal fell through, I made contact with the original US supplier, but they would not give me a price and wanted a volume order to start. I discovered that the original spar cost in the eighties was USD750 for a pair. I tried a local search without success before a supplier of carbon fiber products referred me to Ian Duncan . Ian spent 5 years working with composites and spars for our Aussie yaught challengers for the Americas Cup and now he runs his own business as a supplier of aviation spars for the international gliding market. He has supplied over 2000 spars for Moyes Delta and other gliders. Ian enjoys hang gliding as a recreation. We went to great lengths to analyze samples of the original spar which was supplied with the Quickie kits in 1988. John Tenhave independently made a microscopic examination to confirm our analysis. I am grateful to John for his visit to Ian's workshop and for inspection of my spars. Our analysis found that the original laminate was poorly compacted, poorly aligned and the fiber easily separated. The kit spar is wrapped internally by a single ply of light weight E glass, not carbon fiber. The orientation of the E glass was square and did not provide any torsional strength and minimal hoop strength. When the E glass fails, the spar will easily split. Case in point, my broken spar had the appearance of a paint brush, with many very long, single strands of CF. This is not to say that the original spars are unsafe, as they have an almost perfect track record for the application. But because we had no data as a basis for testing, we decided to make a stronger spar. The first step was to make the mandrel. Ian found a workshop and a tapered aluminum tube was spun for the job. 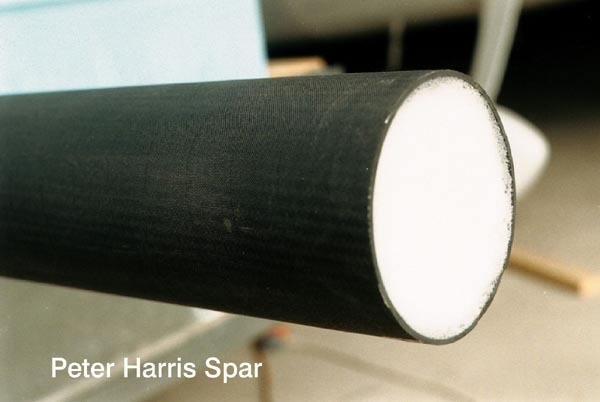 Our spar is 100% carbon fiber, constructed of high strength UNI pre-preg wrapped internally and externally with carbon cloth properly aligned at +/- 45 deg., consolidated at high pressure on a mandrel and oven cured to the pre-preg supplier's specifications. The use of properly aligned carbon fiber cloth in place of E glass is chosen to increase torsional and hoop strength. These spars are stronger by design. In the 20 hours that I have flown behind these spars, I have found no difference in ground handling and the stiffness seems about the same. I have been taking orders for these spars and I recover a small fee to recover the cost and maintenance of the mandrel. I am also leaving contact details for my spar maker with ole Hawkeye in case anything happens to me.